Cardiac magnetic resonance imaging (CMR) is a novel non-invasive modality with many potential indications, and was recently introduced in Lebanon. We sought to assess the appropriateness and diagnostic yield of CMR studies performed at a tertiary referral center from the Middle East since the inception of the program. All patients who underwent CMR studies between January 1st 2013 and June 18th 2014 were enrolled in this study. CMR reports were retrospectively reviewed. The study indication, clinical history, and findings were extracted and analyzed by a level III trained cardiologist. The appropriateness of the study was judged according to the 2010 updated Asian Society of Cardiac Imaging guidelines. There were a total of 142 patients (mean age [SD] 42.1  years, 24.6% female) that underwent CMR study. Two-third of studies were performed on an outpatient basis, and outside referrals constituted 16.2% of the entire cohort. The cardiologists referred 122 cases (86%) with main contribution from electrophysiology and imaging specialists. Of the 142 cases, 12 (8.4%) were not indicated and added little value (Table 1). 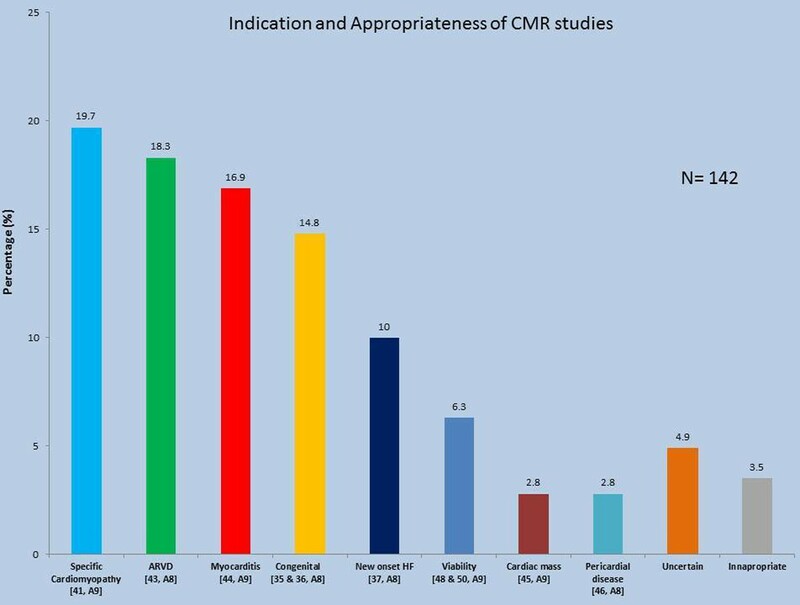 Of the remaining 130 appropriate studies (appropriateness level A8-A9) (Figure 1), one-third had an incorrect diagnosis prior to CMR, and 8% had relevant findings that were missed on other studies but captured by CMR. Furthermore, CMR confirmed the diagnosis in 28% of the cases, provided relevant information on scar burden, shunt quantification, and ruled out infiltrative disease in the remaining patients. Also, CMR demonstrated the presence of scar in 45 of patients, among whom 20 (44%) had significant burden (>5% of left ventricular myocardium). Finally, 9% of patients had a relevant extra-cardiac finding that needed further investigation. Positive family history of SCD. Normal echocardiogram. Concern for ARVD. No syncope or VT. Patient had prior CMR showing minor ARVD criteria with frequent PVCs and low EF. CMR ordered post ablation to assess for scar at the site of ablation and improvement in EF. Patient had an echocardiogram- did not add much information. Despite the recent launch of the CMR program at our institution, the majority of studies were appropriately indicated, provided relevant data and were clinically useful. Inappropriate or uncertain studies did not provide relevant data, and should be further minimized to avoid unnecessary costs and downstream testing. Large prospective CMR database with clinical follow-up is needed to provide more insight about cardiovascular disease and outcomes in our population.